It’s always exciting to see a friend featured on television. One evening in December 2017 we were very excited to see our friend Raffael featured on Südwestfunk (www.swr.de ) German TV. My daughter was doing her homework and I was reading my emails when suddenly an email from Raffael popped up: we should log onto the Landesschau Baden-Württemberg (regional SW German news) in fifteen minutes to watch him. So we did, and he appeared about 4 minutes into the programme. Here’s a summary in English of what we saw, with a few of my own additions. 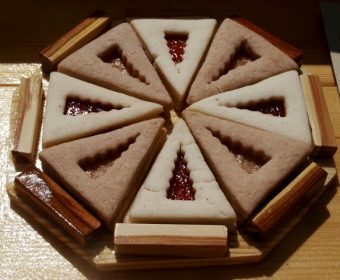 It’s almost too good to eat! 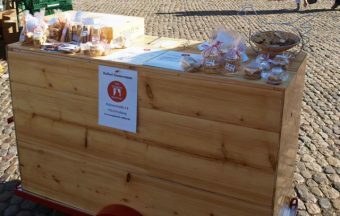 Raffael’s stall on the market is called Teegebäck Raffael – Raffael’s fine biscuits. He gets to the market place by bike, towing his stall behind him with all the goodies inside. You might find him singing to himself as he lays out his cookies on the display shelf on top of the stall. You can see the Münster (cathedral) in the background. 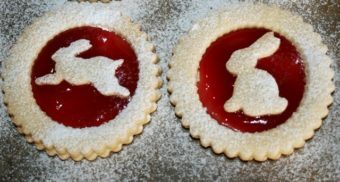 Among his most popular biscuits are Nuss-stängele (hazelnut cookies) and Hildabrötchen (melt-in-your-mouth vanilla shortbread with gelee centre). He often tells customers the story behind his biscuits – the recipes originate from his Great-Grandma. 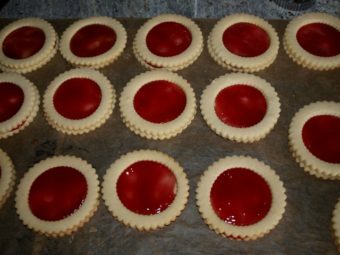 He always uses butter in his baking, so the biscuits have a delicate texture and a mellow flavour. Back home, relaxing with a coffee and biscuit (of course) by candlelight, he admits it’s hard work. His motto is “viel arbeiten und nicht so viel verlangen.” (work a lot and don’t ask for a lot). His work is important; it’s “Genuss für alle: Gebäck und Sozialismus” (A treat for everybody: fine biscuits and socialism). 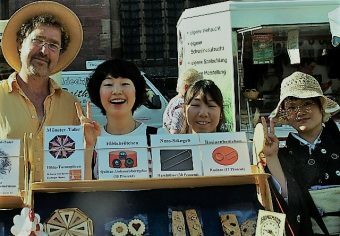 He loves chatting to people at his stall, persuading, explaining, exchanging ideas and recipes. He has his regulars, or “Stammkunden”, and talks about “Gott und die Welt” – everything under the sun. He would have been doing a lot of that sort of talking as a teacher of German and History, but back in his student days revolution was more important to Raffael. 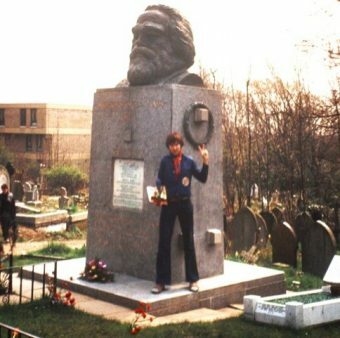 His role model was Karl Marx. The erstwhile Berufsverbot, or career ban on members of “extreme” political parties, precluded him from working for the state. He says it was tough to come to terms with this at first. In the end he accepted it because, after all, he did want to be a member of the working class. 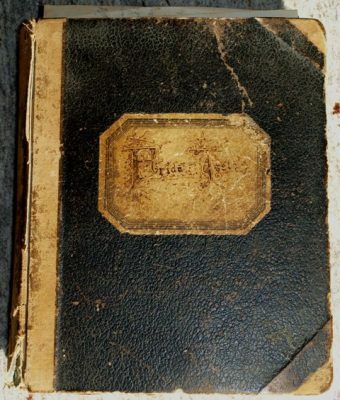 Then one day he stumbled across a family recipe book, nearly 150 years old, in his Great-Grandmother’s beautiful handwriting. The book has been passed down the family. 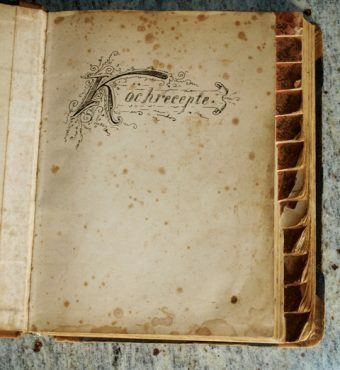 The handwriting in the book changes as his Grandmother and Mother added their own recipes. I remember when I was in a flat-share with Raffael and we were all hugely impressed that his Mum sent him homemade bread and cakes in the post! 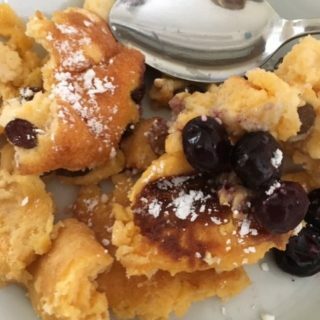 He enjoyed trying out the recipes himself and thought he might be able to turn this family treasure into money: “Gegessen wird immer” (we all have to eat). 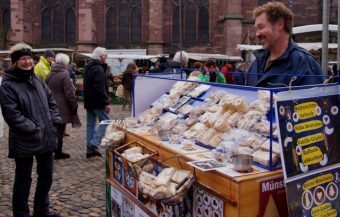 He felt at home in the Freiburg market place and decided to give it a try. He takes pride in baking all his biscuits by hand using high quality organic ingredients. In the film we watch him at work, lovingly preparing everything for the oven. Raffael has gone from Karl Marx fan to entrepreneur, but profit isn’t his be-all and end-all. 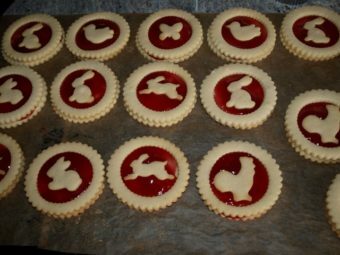 If customers want to bake the biscuits themselves, he simply gives them his recipe. 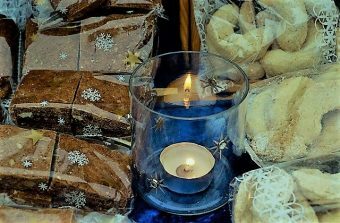 He happily swops biscuits and recipes with customers at his stall, because, he says, there are so many fantastic recipes. 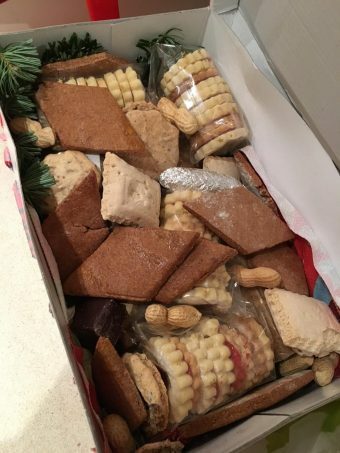 He tells one lady to bring him 200g of her biscuits and choose the same amount of his biscuits from his stall. He’s not “precious” about his creations and he sees no point in keeping his biscuit recipes secret. We hear him asking one customer what jam she uses, and another what her favourite biscuits are. You need spicy biscuits in cold weather, he advises another. Back in their allotment, he and Andrea, his partner of 20 years, are contented doing their own thing. Raffael likes to work with wood and make his own furniture. Then suddenly one of them will say to the other: “Can you hear that bird singing?” We see them enjoying a glass of wine on their balcony. He’s found his own kind of heaven: he’s happy at home on the balcony with the sun, birds, flowers and Andrea. 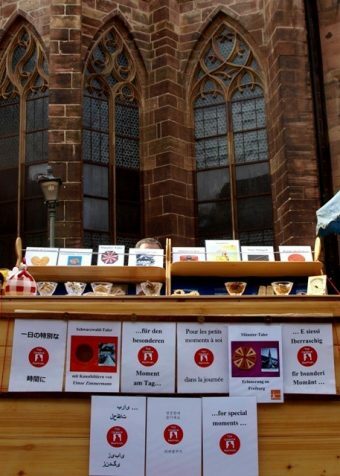 The day after the programme was broadcast, Raffael said business at his stall was “hyper”. www.zdf.de/nachrichten/drehscheibe/drehscheibe-vom-6-maerz-2018-102.html. His slot starts 29 minutes into the programme and will be available for one year from the broadcasting date of 6.3.2018. Raffael’s website at www.teegebaeck-raffael.de has some lovely photos. The site is in German, so I’ve summarized it below in English and added in some info I already knew. When he first set up the business in 2011 I wondered how he baked his biscuits (surely not at home? ), how he transported his stall to the market place without a car or van, how to find him there and which biscuits he usually had on display. So here are the answers to my questions. Raffael is an “Ein-Mensch-Betrieb” (a one-man band) so I’m amazed that he gets so many biscuits baked on his own. He rents a “Backstube” (bakehouse) on Wednesdays to prepare his next batch of biscuits. 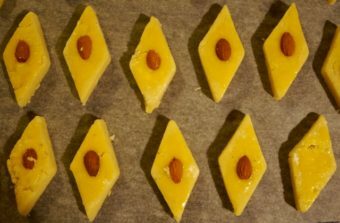 His basic ingredients are flour, butter, sugar and egg with added nuts and spices. 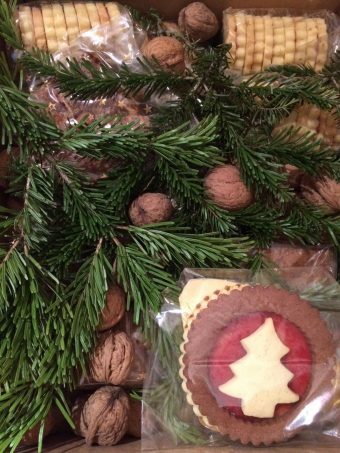 Raffael thinks that nut and vanilla flavours bring back memories of people’s childhood, and especially of Christmas. 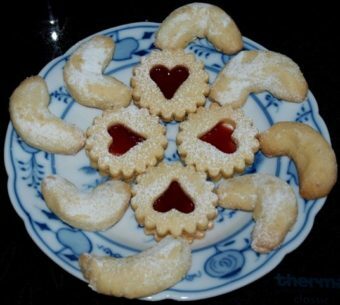 Apart from the Hildabrötchen, all the biscuits are made with spelt flour. 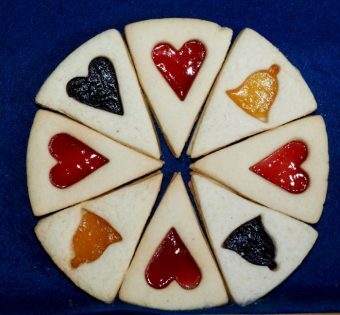 The biscuits keep for at least 4 – 6 weeks, which is where he has a huge advantage over stallholders who sell perishable foods such as salad vegetables or cakes. He’s constantly refining his recipes and on the look out for something new to tempt the locals. 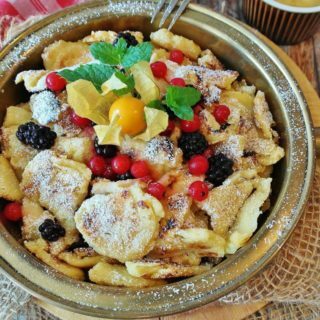 He gets lots of tips from his customers: one of them advised him to roast the almonds and hazelnuts before baking, to enhance the flavour. 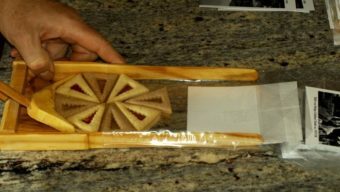 He developed a recipe for shortbread biscuits using salted butter and fresh rosemary, slightly browning them to enhance the salt and herb flavour over the butter. 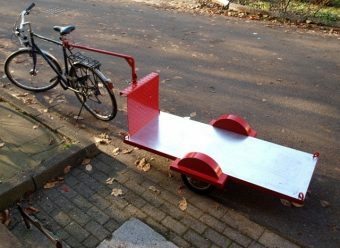 Raffael bought the basic structure for the bike trailer and adapted it himself using pinewood to make a sort of lightweight, flexible chest of drawers on wheels. The 20 minute ride from his home to the market is bumpy in places on the cobblestones. So he stuck the trailer-stall together with glue rather than nails so that it still had some “give” in it. “Fortbewegung nur mit Muskelkraft”, as Raffael put it – transport by muscle power only. 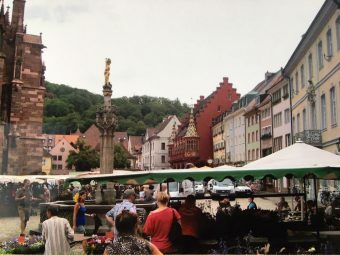 Go to the area for Selbsterzeuger (home produce) near the Brunnen (fountain); the Teegebäck Raffael stall will be parked next to Stefans Käsekuchenstand (cheesecake stall). Raffael’s slogan is “Für den besonderen Moment am Tag” – for that special moment in the day. 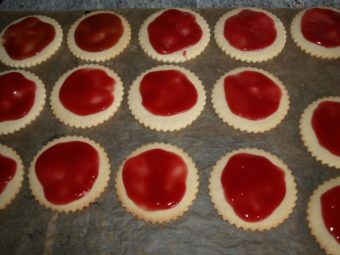 The cheesecakes on the next-door stall look amazing too – so for me, that might provide another “special moment” next time I go to Freiburg. He’s usually at the market on Thursdays and Fridays – but check his website for updates. If rain is forecast, he changes the day(s), because people don’t buy special biscuits in wet weather – they just buy the essentials. Stall-holders on the market place have the freedom of self-employment and are part of the market community, but it can take a couple of years to get well established. Most of the business on the market comes from locals, rather than from tourists. And it goes without saying that you’ve got to like the outdoor life. 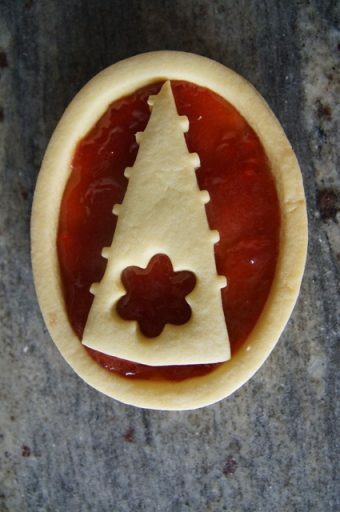 These are the same shape as the Münster tower, with redcurrant gelee for the stained glass. 50% of profits from these go to the Münsterbauverein, the cathedral restoration fund. To make these Raffael had to get a special cutter forged by a metalsmith. He made the wooden case himself. 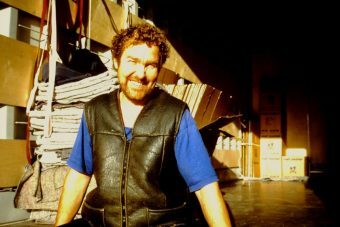 The photo below was taken in the bakehouse, as he was packing the Münstertaler ready to sell. This gives you an idea of the size of the biscuits. 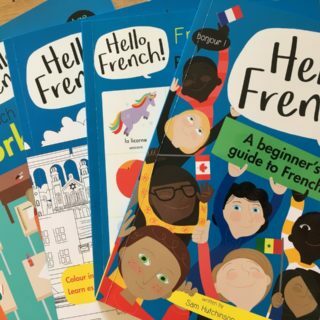 These are my favourites! 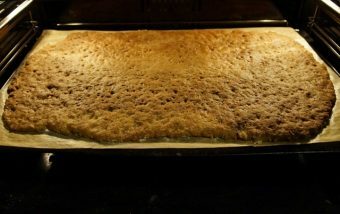 They’re based on a Swiss recipe, made with ground and chopped hazelnuts. 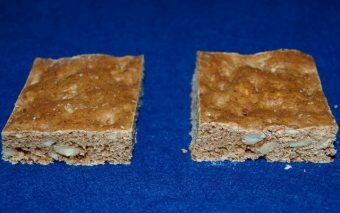 The proportion of nuts to spelt flour is 50%. 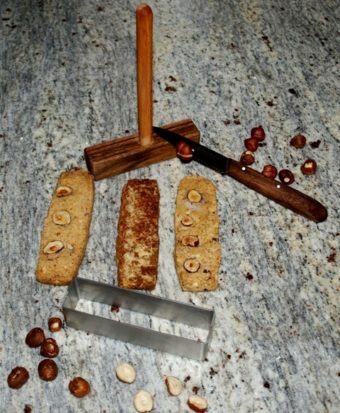 To cut the nuts Raffael uses a massive custom-made mortar made of walnut wood. He stamps out the mixture into rectangular shapes with a special cutter made by a metalsmith and decorates them with nuts cut in half. After baking he dusts them with lemon icing sugar. Raffael tried out 30 different recipes before opting for this one. It’s like a shortbread, in a small crescent shape. The sugar content, at 10% is the lowest of all his biscuits. Here some of them are framing the Hilda-Brötchen. Just add some friends and some cups of coffee. 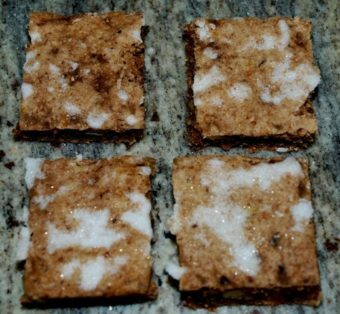 These are a bit like the traditional German Lebkuchen. 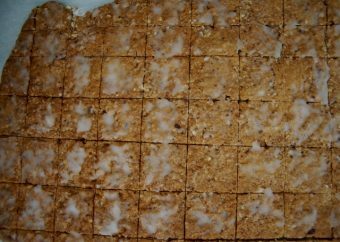 They’re more like a cake texture, flavoured with honey, hazelnuts, dried apricots, cinnamon, candied lemon peel and clove. 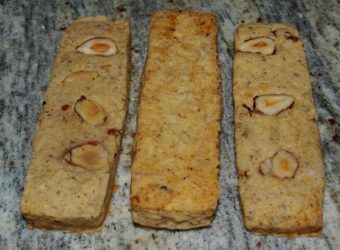 These are a spicy Pefferkuchen with honey, nutmeg, cinnamon, almonds and dried apricot. 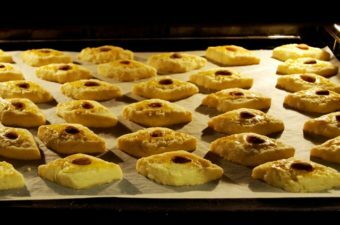 The recipe, from Augsburg of course, is 400 years old. Raffael recommends one bite every half hour when you go hiking in cold weather, to feel the ingredients warming you up inside as you walk along. 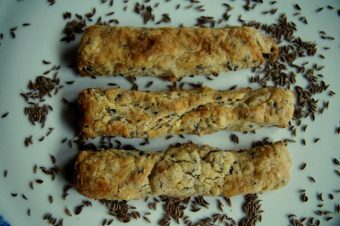 These are cheese sticks with caraway seeds. Some customers asked about savoury biscuits, so Raffael developed these from a mix of his Mother’s Käse-Stangen (cheese straws) recipe and his Grandma’s Sauerrahmkuchen (sour cream bake). We visited Raffael in 2012, a year after he set up Teegebäck Raffael. It was a sunny day in August and we got a warm welcome from him and Andrea in Badenweiler near Freiburg. 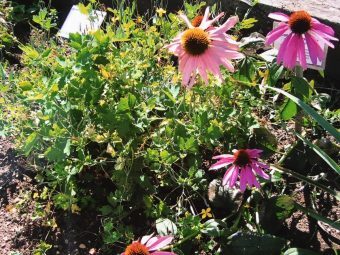 The first thing he showed us was the community herb garden – explaining the healing powers of certain plants, which is another of his interests. 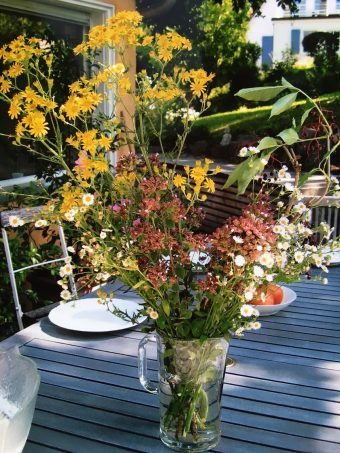 Next came lunch in the garden – including homemade Flammkuchen, a speciality from this area and from Alsace. It looked a bit like pizza but without the tomato topping. 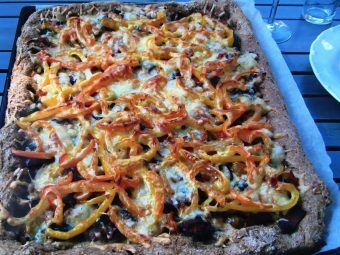 Instead he spread sour cream, herbs, bacon and caramelized onions onto the dough…It’s enough to say that if our daughter hears the word “Flammkuchen”, she remembers helping Raffael to make it, and most of all, how it tasted. Don’t tell anyone! He probably can’t start selling Flammkuchen as well as his biscuits. 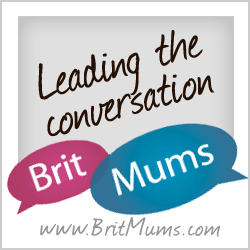 It would be good to hear about other interesting career changes. Or do you have any favourite family recipes which have been passed down to you?